Oil the grill rack and heat grill to medium high. Standing mango upright, cut two lengthwise slices, each about 1/2- inch thick, from each broad side of the mango. Cut 1/2- inch thick slices from the two remaining sides and repeat with the other mangoes for a total of 12 slices. Reserve any remaining mango to munch on raw; discard pits. Score mango flesh in a cross-hatch pattern about an inch apart, being careful not to cut through skin. Grill, flesh side down until grill marks appear and flesh turns golden brown, about 2 to 4 minutes. Transfer mango, flesh side up, to a platter until cool enough to handle. Take a mango slice and push from skin side to turn inside out. With a sharp knife, cut grilled mango flesh away from the skin; discard skin. Take a piece of aluminum foil about 18 inches long. Pour coconut into center of foil and fold sides and ends towards the center making a sealed pouch leaving enough space so the coconut can move freely within the pouch. Place the pouch directly on the grill rack for 4 to 5 minutes shaking the pouch frequently so the coconut browns evenly and doesn't burn. Take caution (use an oven mitt) when opening pouch and checking coconut for desired amount of toasting and doneness. Place pound cake slices directly on grill and flip after 3 to 4 minutes or when grill marks have appeared and cake begins to lightly brown; repeat on both sides. 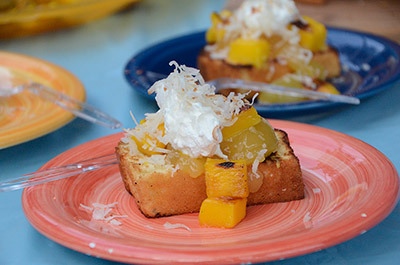 To assemble dessert, place grilled cake slice on a plate, add a couple of spoonfuls of lemon curd, 6 or so cubes of mango, a spoonful of whipped topping and sprinkle with toasted coconut.